Armasight is a US-based company and a subsidiary of FLIR Systems Inc. as of June 2016. 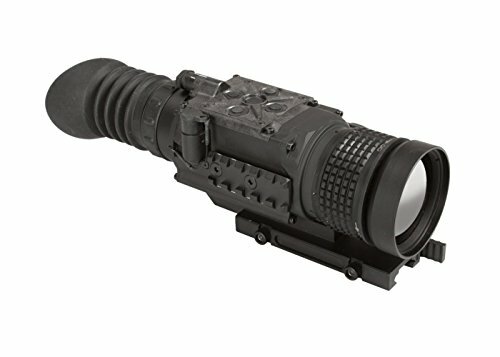 The brand has a reputation for producing advanced thermal imaging and night-vision solutions among other illuminating products. 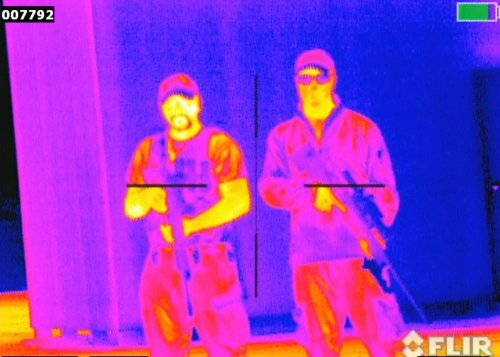 Being a global leader, the company produces thermal imaging products for the military, law enforcement, hunters, and outdoor enthusiasts. The Predator and Zeus lines of thermal imaging scopes are among the top of the line models in this industry. The Predator line of thermal imaging scopes was introduced in 2015. This line targets hunter’s who do not need high magnification. The line consists of scopes with a pixel array of 336×256 pixels as well as 640x512 and LED display of 640 x 480 pixels. Predator scopes are available in both 30Hz and 60Hz refresh rates. The 60Hz scopes are designed to offer smoother images of moving targets. 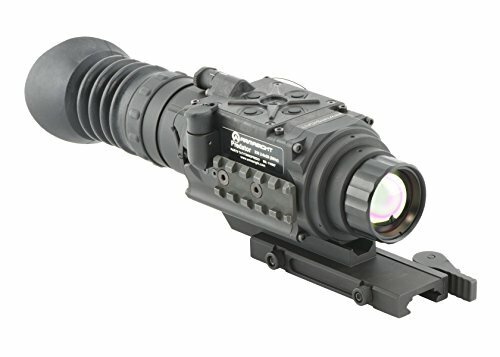 The Predator line has small scopes with fixed focal lenses which means it is simple to operate. 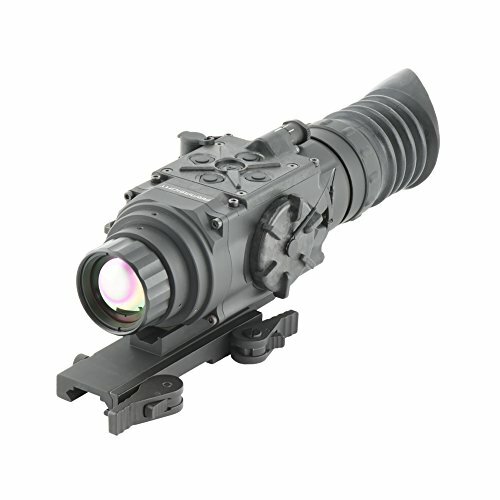 The Zeus line is a newer line compared to the Predator line and offers a large selection of powerful optics. The viewer has been upgraded to AMOLED with 800x600 pixels providing sharper more contrast images. The Predator 336 2-8x25mm thermal imaging scope is a perfect choice for the avid hunter. It produces excellent images thanks to its uncooled, solid-state, magnified, long-wave infrared microbolometer. It can cut through snow, fog, dust, haze, and all other atmospheric obscurants easily. 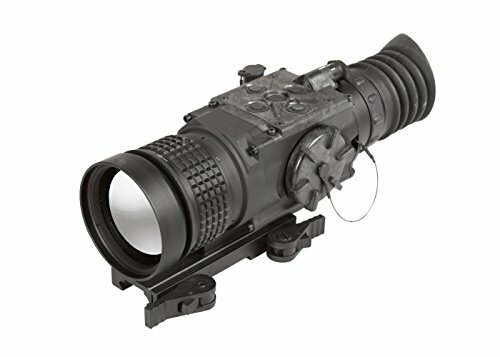 Day or night, this scope is unaffected by light, and it remains undetectable as it emits no RF energy or visible light. You not only get to use this scope as a weapon sight, but you can also use it as a handheld thermal imager or a magnified spotting scope. Whether you are a military marksman or you like to stay out hunting, you will get help from a versatile scope that will get you through tough situations. You get to see images on a high-resolution LED display. It also gives you the chance to view your images through the video output port. This way, you can view images on a monitor or use the port to import files from other sources. This scope has a 30Hz refresh rate which makes it a good choice for still images but not so much for moving targets. If you are in the wild tracking a deer, you are better off with the 60Hz model. It prevents blurry images so you can track better and have better chances at taking down your target. This scope has an aluminum alloy housing. It remains a lightweight model that you can carry alongside other gear. You will like that you can use it in adverse weather environments because it is O-ring sealed and is nitrogen filled. It can withstand water and fog as well as the harshest of conditions. 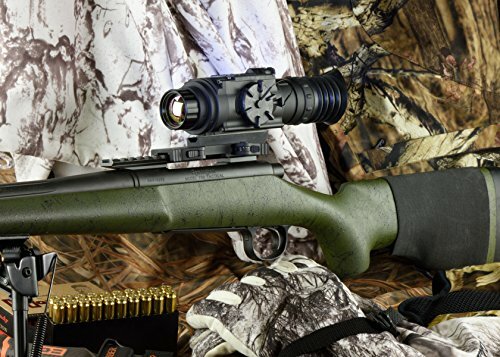 Read our Armasight Predator 336 detailed review here. 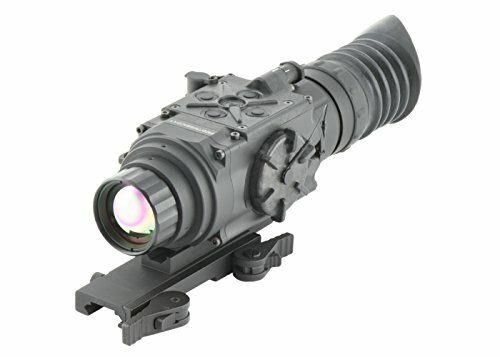 This scope is also a dedicated day and night thermal scope that you will not need to switch or re-zero. It has the famous FLIR Tau 2 VOx, uncooled microbolometer that showcases incredible performance in harsh environments. With its thermal imaging technology, it can see in fog, dust, smoke, and haze. You will like that it is not laser-based, so you do not need to augment its presence with other devices. Instead, you get a device that does not produce visible light or RF energy. This scope uses advanced digital imaging tools to provide the most highly-contrasted images no matter your environment. From Active Contrast Enhancement (ACE) which allows contrast optimization in a particular scene to Second Generation Digital Enhancement (DDE) that provides clearer imagery, it is a remarkable scope to look through. It is complemented by Smart Scene Optimization (SSO), Automatic Gain Control (AGC), and a manual non-uniformity correction (NUC) as well as a silent shutterless NUC. It also has six reticle colors and an electronic zoom reticle tracking capability. This is a high-performance thermal imaging scope. The features are exciting from the adjustable filtering tools to the high resolution and the simple installation, it’s going to be a blast with this thermal scope. Read our Armasight Zeus 336 detailed review here. Armasight wants to give you 24/7 operation, and that’s what the Zeus-Pro 336 4-16x50mm is all about. It boasts a superior design that showcases what Armasight has to offer. This scope comes with an uncooled microbolometer designed to face off in the worst circumstances. 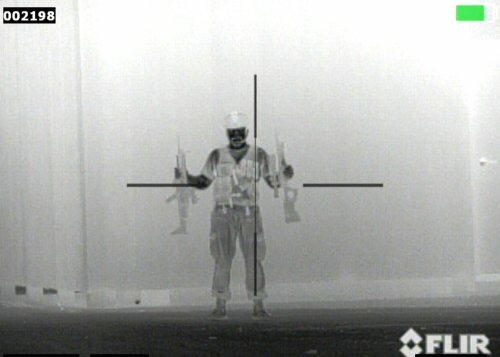 When we talk about the worst, we see a thermal scope that can withstand immersion in a depth of 20 meters for 2 hours. If you ever dropped it in the river, be sure it’s going to come out working as new. We like that it has also been built to be used with weapons with 50BMG level recoil and shock. This means you can take consecutive shots without re-zeroing. The Zeus-Pro uses a 336 core which indicates it will showcase images in 336 x 256 pixels. It is offered in both 30Hz and 60Hz refresh rates, so that you can choose your sight according to your targets and environment. This scope has a 50mm Germanium objective lens that you get to use with variable magnification from 4-16x. It is not high or low, so your images will appear clear whether at the lowest or highest magnification. The OLED display and video output options are also an excellent addition to this thermal sight. Accuracy is everything for everyone in the military and law enforcement. You don’t want to take down the wrong target that is why you need to see clear as day even if you are shooting in the dead of night. 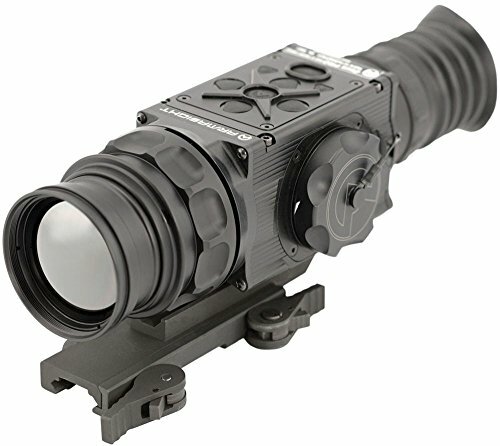 Armasight presents their top performing thermal imaging sight on a budget. The thermal sight features all the great specs of a good thermal imaging sight including a high resolution of 640 x 480 pixels. 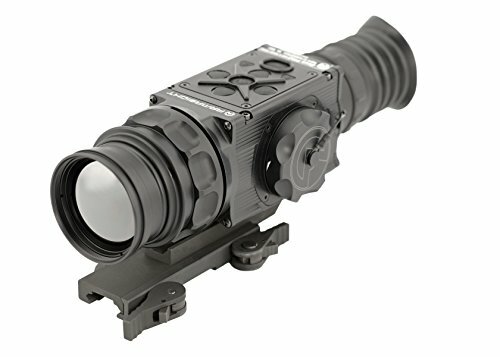 This thermal sight showcases high-clarity images that come in handy for target acquisition and identification. You can’t go wrong with a Predator model as it has low magnification from 1-8x. It is a good pick for close range targets. Think of how fast you can find your target in low power especially if your target appears from nowhere. We cannot say the same for high power thermal scopes in close range hunting. This model follows through with all the other specs including layering of the menu for simplicity to seeing through atmospheric obscurants, color modes, and imaging filter tools. This Scope represents versatility. It has a bigger objective lens that makes it more capable in no light conditions. The scope will sit low on your weapon so that it can be used every single day with a high-recoil rifle. 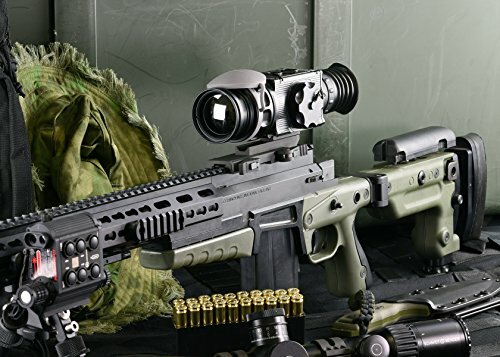 The Armasight by FLIR Zeus 640 also uses the latest thermal imaging technology. The uncooled microbolometer works great in all forms of obscurants, and it can also take on immersion for 2 hours in water that is 20 meters deep. It has a wide array of transmission properties and a 640 x 480 pixels thermal sensor that allows it to give fine details in every thermal image that you see through the scope. Now you don’t have a reason to miss a target because of poor image quality. When it comes to controlling and operating this scope, you will be dealing with a layered menu and direct button controls that are simple and effortless to master. This gives you an advantage when you need rapid changing of different functions in a high-stress environment. With a 60Hz refresh rate and a 640 core, the Zeus-Pro has a wide array of applications. It has a long range of magnification which makes it ideal for both short and long range shooting. Whether you are in shooting sports, law enforcement, or the military, you will definitely want a flexible scope that you can use with most of your weapons. This scope provides outstanding imagery. Not only because of the Germanium objective lenses, but also because of the 640 x 480-pixel array on an uncooled thermal detector. It keeps you in the clear when going after moving targets thanks to the 60Hz refresh rate that makes it easier to focus and zero in on a target. We like that there’s also a 30Hz model that will work perfectly for still targets. With the electronic zoom, you can look in closely since it provides an easy way of figuring your target out from its background. It is accurate, and a definite pick for day and night excursions. 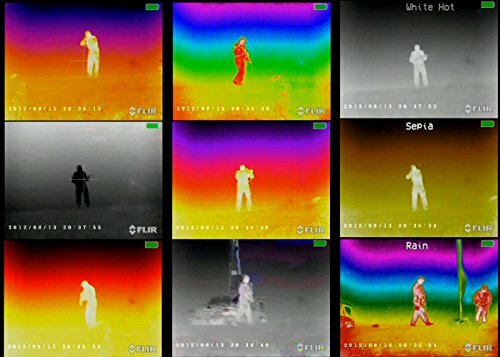 Thermal imaging scopes bring to you what you could never see with a night vision scope. Armasight is a top contender in the market so you can be sure that you are investing in one of the best. 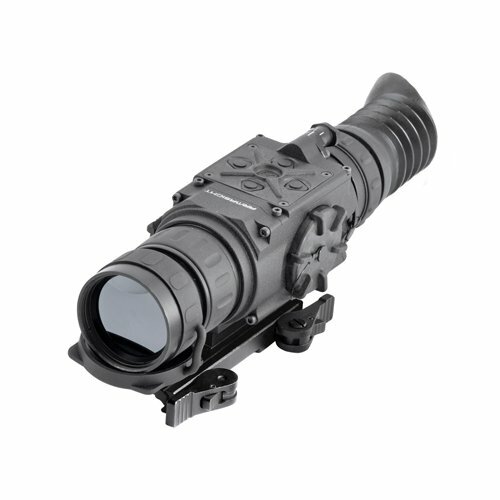 Our top recommendation comes from the 640 core which is the entry-level model; the Armasight by FLIR Predator 640 1-8x25. It represents high accuracy and clarity in thermal imagery with a scope. You can choose from the 30Hz or 60Hz according to the targets you intend to track. For an avid hunter looking to get an easy to use thermal imaging sight, the Predator 336 2-8x25 (30Hz) Thermal Imaging Weapon Sight might be the ultimate pick for you. It can withstand the harshest outdoor conditions which is what you want in a thermal scope.